EV proponents seriously underestimate the seriousness of the battery recharging time element and the obstacle it will become to establishing large fleets of EVs on American roads. The EV industry has established a reality distortion field in order to avoid the unpleasantness of a fact that impairs their marketplace agenda and the media has more than contributed to the downplaying of range anxiety and recharging time, which makes this piece from Popular Mechanics refreshing. 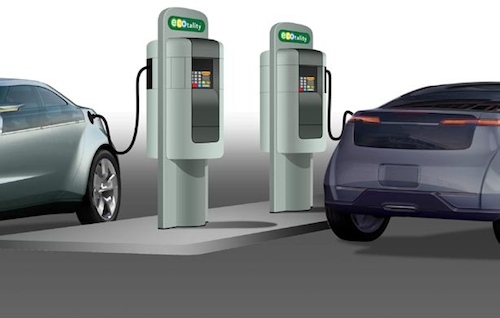 Listen to Mitsubishi and Eaton, and they imagine a future where quick chargers could be positioned at Starbucks, McDonald’s or, yes, Sonic drive-ins. Drivers could pull in, hook their i-Mievs up to the system and sit back and enjoy a latte, Big Mac or whatever it is Sonic sells. After that relaxing respite, they’d stroll back to their driving appliances and continue their journey. It’s their alternative to the extended range offered by the upcoming Chevrolet Volt’s on-board internal combustion engine. Their dream may be a good one. But it’s also problematic. There were, after all, five i-Mievs on this drive that needed charging, and with only one charger it didn’t take 20 minutes to fuel them. It took about an hour and a half. The idea that “quick chargers” will proliferate in retail establishments is fantasy, for the same reason that free wifi has not become a fixture in American retail… it’s not core to the business, discourages normal customer turnover, and can result in unnecessary customer backlash when something doesn’t work right. Oh yeah, it a straight expense for business… which to paraphrase Yogi Bera “is almost the same as money”. Let’s deal with the cost issue first, quick rechargers are expensive to acquire and install for good reason, they are complex pieces of precision equipment that push a large amount of electrical energy at a controlled rate and control heat buildup and potentially catastrophic personal injury in the event of failure. The cost to install is also not insignificant as it represents a physical infrastructure project that requires planning and permitting, often in locations where retail tenants are just that, tenants and not owners. What about the case where retail outlets are located in strip malls or other multi-use facilities? Would the cost of installing and maintaining the chargers fall to the owner with the cost then spread to all tenants whether or not they want the quick chargers? If so commercial landlords would certainly consider the potential which the increased rent expenses would put them at a competitive disadvantage. Proponents would say that the recharging stations would increase the appeal, but in reality this would not be the case with a handful of pumps operating in a fashion that excludes the overwhelming majority of visitors from taking advantage of them. The last two issues related to cost are insurance and actual electricity… the former would certainly increase by the mere fact that the recharging stations exist and represent property and liability risk. The electricity is nothing the shrug off with the “well they will just have solar” comment because solar only works when the sunshine is available and business operates whatever the weather forecast for the day and also at night, which means that businesses will absolutely incur a spike on their power bills, all while making expensive efforts to comply with government mandates at all levels and a dealing with already rising power costs that eat away at their economics. While all of these issues are formidable, perhaps no more than the time issue. Even a 20 minute quick recharge, as Popular Mechanics points out, is a huge barrier when you are the 5 car in line… now it’s not 20 minutes but more like an hour and a half when you factor in “setup time”. Even 20 minutes is significant at places like Starbucks and McDonald’s where a significant number of customers don’t consume their purchases on location. Is Starbucks really prepared to deal with a stream of customers who from the moment they walk in the door are unhappy because the recharge line is going to make them late for work? Commercial fuel stations face an even more insidious problem, which is that the pump customer turnover makes it impossible to earn a living. A commercial fuel station with 2 islands of pumps can fill well over 100 cars an hour but with the same number of EV recharging stations that number would drop to under 25, all the while selling a product that generates far less revenue and even taking into account the improvement in profitability would be no relief for a business that fails to cover their fixed expenses. EV and utility companies predict a future where motorists will pull into their garages at night and recharge their frugal EV for the next days use but that scenario fails to take into account many uncomfortable realities that real people deal with. We don’t always have garages, certainly not the 350,000 people who park on the streets of San Francisco, no doubt a target market high on the list of every EV company. We also don’t have predictable driving habits with unplanned trips and errands consuming large amounts of behind the wheel time, and we don’t have purpose specific vehicles because of taxes, license, and insurance reasons so having an EV “grocery store car” is nice on paper but not a realistic use case. I’m all for having an expanding fleet of EVs, not only is an environmental master served but also a security issue that derives on global dependence on oil produced in an unstable part of the world, but I’m pragmatic enough to realize that large fleets of EVs are unrealistic to expect because humans are too messy to fit nicely in the narrowly constructed use cases EV manufacturers put forward. For better or worse the internal combustion engine is a remarkable engineering feat that combines efficiency, utility, and range by which EVs will be measure against and this is the single biggest problem that EVs face, they are simply don’t have the utility that their gas counterparts offer.